Americans took a record 10.75 billion trips on public transportation in 2014, according to annual ridership statistics released this month by the American Public Transportation Association (APTA). This is up from 10.65 billion trips in 2013, with the number of trips outpacing population growth. In a year of low gasoline prices, the increase is welcome news for the public transportation industry. Nevertheless, CityLab’s Eric Jaffe has advised caution at reading too much into these numbers, pointing out that New York City’s transit ridership skews the data, and that overall, bus ridership is down. Also, Washington D.C.’s ridership numbers have been decreasing. Apart from the ART Bus in Arlington, Washingtonians’ use of public transportation declined between 2013 and 2014. The decreases are not dramatic, but are still worrisome. There are several potential reasons for D.C.’s dip. Two that warrant consideration are the extent to which the commuter tax benefit has influenced these declines, and the (more optimistic) possibility that some public transit riders are being siphoned off by alternatives such as Capital Bikeshare. The commuter pre-tax benefit allows participating employees to deduct the cost of their commuting expenses, tax-free, from their paychecks. The transit benefit was reduced, effective January 1, 2014, to a level for transit ($130 maximum per month) that’s roughly half that of parking ($250). I reported on this back in November to coincide with the release of a TransitCenter report stating that the federal government is basically subsidizing congestion. Transit advocates and transportation planners fear this policy because of the potential incentives it creates. Because the transit benefit is so much less than the parking benefit, driving appears to be considerably more attractive in comparison. In case anyone still doubts that federal tax policy can influence commuting behavior, the news from the Washington Metropolitan Area Transit Authority (WMATA) isn’t good. The agency has released convincing data on its PlanItMetro blog indicating that the reduction of the transit benefit is at least partially responsible for a decline in Metro ridership in 2014. 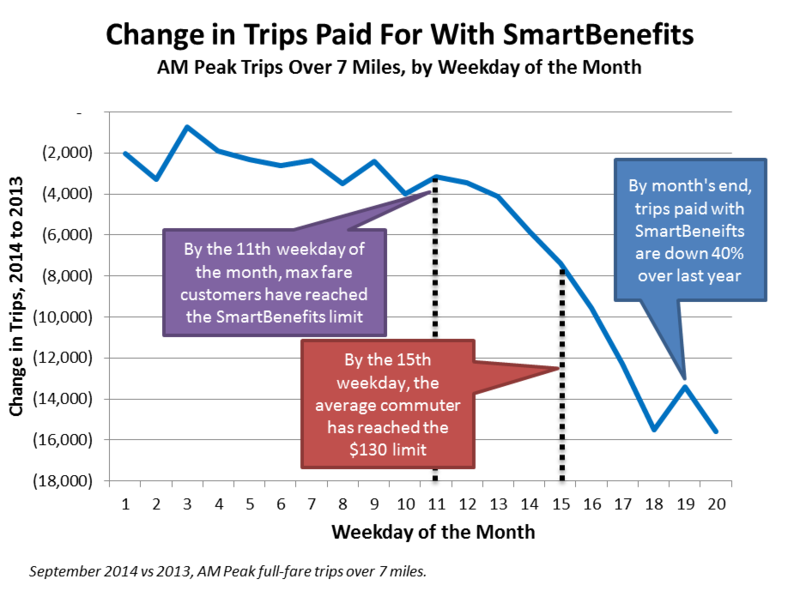 WMATA estimates that the lower transit benefit results in 25 percent of its riders running out of SmarTrip benefits before the end of each month. This is 40 percent more than the year prior (see chart below). While some riders replenish the amounts on their SmarTrip cards when their monthly benefits run out, many do not. This explains why Metro ridership in 2014 was higher at the beginning of each month than the end, and why ridership on Metro was down for the year overall. The Washington Metropolitan Region, with its large number of federal workers, certainly feels the impact of the reduced transit benefit more than other areas. 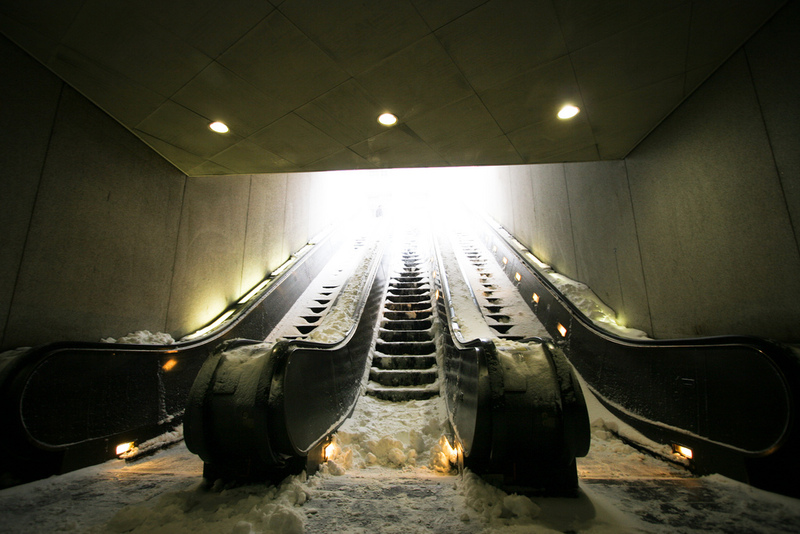 Organizations such as the Northern Virginia Transportation Commission (NVTC) have called for immediate action by Congress to restore the transit benefit to a level equal to the parking benefit. Another potential reason for Washington’s lower transit ridership numbers is that our region has more options, notably Capital Bikeshare. As these bikesharing stations have proliferated, commuters have another transportation option that’s not only being utilized as a connection to bus and rail, but often as a commute mode in its own right. Public-transportation agencies like WMATA, meanwhile, have an improved, holistic, view of transportation these days. Capital Bikeshare, the largest and most successful bikeshare systyem in the U.S., is no longer considered a competitor to public transit so much as a complement to it. And although proponents of bikesharing services like to refer to them as “bike transit,” ridership numbers are not included in the APTA public-transportation data. With 2.8 million trips taken on Capital Bikeshare in 2014 (and increasing), bikeshare trips aren’t insubstantial. Paul DeMaio, an Arlington County consultant largely responsible for the creation of Capital Bikeshare, told Mobility Lab, “Capital Bikeshare both pulled trips from Metrorail and Metrobus and helped folks get to rail and bus. With CaBi trips mainly taken in the urban core of the region, bikeshare has assisted slightly in lowering the peak-period crush on Metrorail and Metrobus.” In other words, yes, D.C., your lower transit trips might be for a good reason. Chris Hamilton, bureau chief of Arlington County Commuter Services, downplays the significance of any regional trends. He said something that’s “happening on the ground in that individual place” isn’t indicative of what a long-term trend might be. Localities, he added, should only be worried about lower transit ridership if drive-alone rates are increasing. In D.C. and Arlington, that trend has not been seen yet. Arlington County prides itself, in fact, on moving more people without increasing traffic on its arterial roads, largely through employment of transportation demand management techniques that inform and educate citizens about their options. Both the Transit Tax Parity Act of 2015 (H.R. 1043, Rep. Holmes-Norton) and the Commuter Parity Act of 2015 (H.R. 990, Rep. King) would restore parity between the transit and parking benefit permanently. Click here to support these bills. Splash photo by Flickr user m01229. Photo by Flickr user Bill Couch. Graphic courtesy PlanItMetro.